Holiday Cakes – ORDER TODAY! 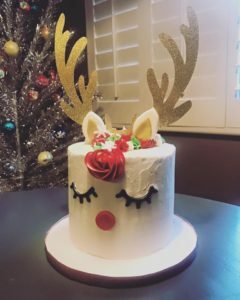 I have 4 spots available for a reindeer cake for pickup on 12/22 or 12/24- call today if you need a holiday show stopping cake! I am still taking a limited number of orders for your New Years Eve celebrations! Grab a spot now to pick up on 12/30 & 12/31! Cake pops, cupcakes ,or a New Years Eve cake are a great way to ring in 2018! Call, text or visit my Facebook page to get your order started!